Italy's tourism authority is asking its hotels to provide hot water in rooms and calling for more signs in Chinese in a bid to encourage extra visitors from China. While China's tourism administration reported a record 40.95 million outbound tourists in 2007, Italy was lamenting the fact that only 800,000 were Italy-bound. Italy is the world's fifth-largest tourism destination, logging 43.7 million arrivals in 2007, according to the United Nations World Tourism Organization, yet it is hardly registering on the consciousness of Chinese travelers. 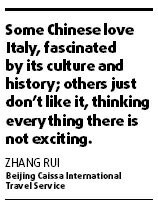 "Chinese tourists' impression of Italy is divided," said Zhang Rui, a marketing manager with the Beijing Caissa International Travel Service Co Ltd. "Some Chinese love Italy, fascinated by its culture and history; others just don't like it, thinking everything there is not exciting." Some tourists have complained about Italian hotel rooms being old and having a smell, she said. And they have bemoaned the language divide, comparatively slow-paced lifestyle and unreliable trains. Chinese have also said they would have liked warm water in their rooms. Wang Fang, a Beijing TV anchor, complained in her blog that she wasted time returning a rented car at the end of a trip to the Italian island of Sardinia because most stores closed at noon and because employees of the rental car branch had left to take a nap. Another blogger from Guangdong province said he could not find the subway from the airport because of the language barrier. "Many locals do not speak English. Some spoke English, but in a way we could not understand. It took us half of an hour to find out the subway had actually closed an hour earlier," he wrote. A lack of audio-guides and Chinese signs at museums also disappointed him. But the Italian Government Tourist Board hopes it can address many of the shortcomings by opening a Beijing office in January. It will help improve services for Chinese tourists and strengthen promotion efforts in China, said Cristina Lambiase, activities liaison officer with the board. The Italians hope 1 million Chinese will visit the country by 2011. 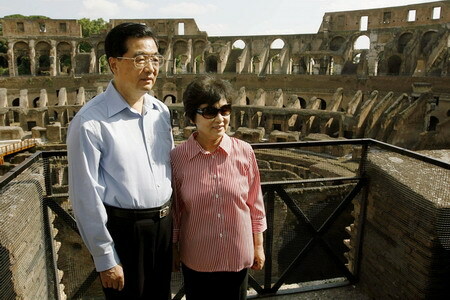 Shao Qiwei, head of the National Tourism Administration of China, said China will open a similar office in Rome soon. In the first five months of the year, the number of Chinese tourists visiting Italy increased by 20 percent, he was quoted as saying by Xinhua News Agency.